1.5 What is , and what is not, included? Confirmations and travel grants: To be announced! ImageJ macro language, recorder & editor; macro language; variables, strings, user-defined functions, loops & conditional execution; batch processing and automation. Interfacing between Matlab and Omero. Image analysis workflows with actual biological problems (based also on expressed interests of selected applicants). The official course textbook is “Bioimage Data Analysis”, a freely downloadable textbook. The training will include some of those exercises as well as new topics. Who should apply? Staff scientists, graduate students, post-docs or faculty dedicated mostly or exclusively to bioimaging facilities and providing direct assistance and training to users. Should have potential for dissemination. 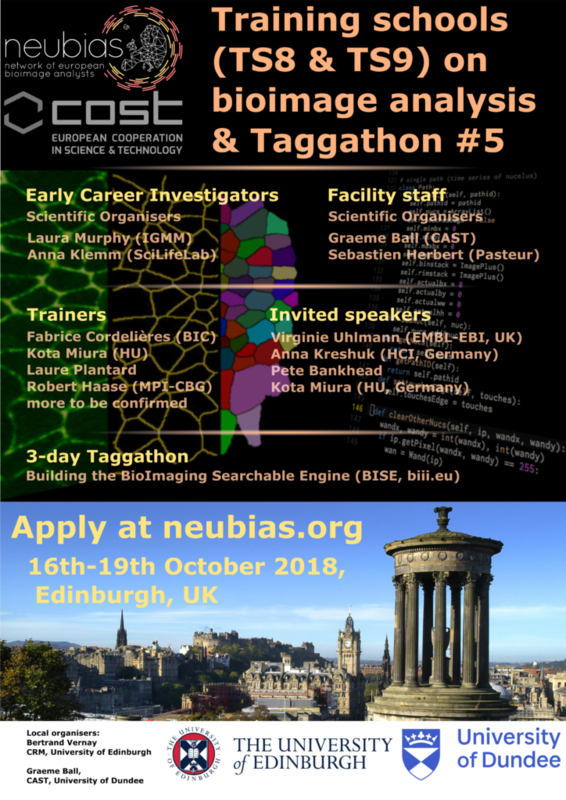 We expect experience in handling image data and familiarity with imageJ/FIJI; this course is not appropriate for complete beginners (NEUBIAS is offering also a Training School for Early Career Researchers in the same venue/dates)! Basic programming knowledge is a plus, but not a requirement. Accepted trainers will be sent a brief tutorial to prepare in advance for the school! Applicants are required to write a small letter of motivation (pasted into registration form), mention their current level of proficiency and interests, propose a workflow and dataset(s) to test & improve and show potential for dissemination. Must be able to pay administrative charges by bank-transfer (credit card or paypal payment not possible) before July 15th 2018. Must comply to administrative conditions (as explained in the end of application form) and, after being selected, send confirmation of travel arrangements before July 15th. Bertrand Vernay – (local organizer of the Edinburgh event), Facility head of Imaging Center @ MRC Centre for Regenerative Medicine, Edinburgh, UK. What is , and what is not, included? 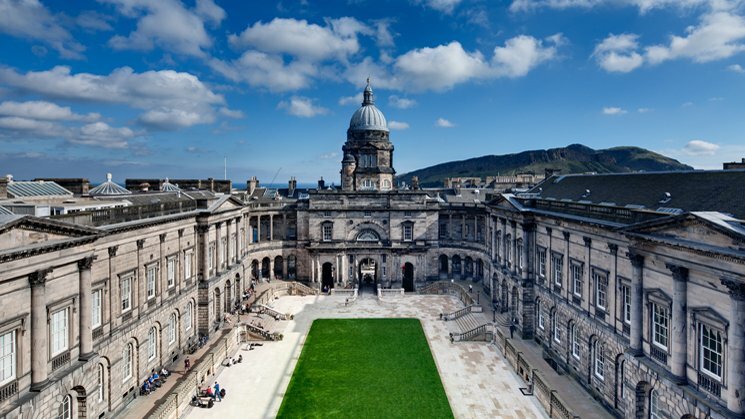 NEUBIAS will offer 7 competitive Travel Grants to a number of the Trainees applicants affiliated to institutions in COST member countries or Near-Neighbour Countries or approved European RTD Organisations (check definitions in COST Vademecum here). Please check in the application form how to apply for those grants by filling the additional fields enabling to submit a justification. We typically provide less than 1/3 of the grant applications received, so any documented information provided to demonstrate why you need a travel grant is important for us to fully assess your request. The grants are supported by COST (funding body of the NEUBIAS Action). Eligibility and reimbursement modalities will follow the criteria/general COST policies (check the Vademecum here). Granted trainees will be notified before June 30th. Please be aware that grants can only be executed AFTER the Training School (daily signature on attendance sheets compulsory for grantees). The grants are attributed at a fixed rate (TBD) to cover for travel and accommodation. Trainees will be selected strictly on the basis of their scientific motivations, as described in their motivation letter. Upon selection, NEUBIAS will seek proof of the candidates status as facility “Staff” as described in the motivation letter. Gender balance and geographical distribution will be taken into consideration according to COST policies, and only after pre-selection of eligible/suitable candidates and in the case that applicants are too numerous as compared to the number of available seats. Evaluations of the applications is operated by “double anonymous” (no mention to name, institution, country) review by the Training Schools Evaluation Committee of NEUBIAS.